Fabio is the CEO of Alliance Group Ltd. He brings to the company 20 years experience in finance, aviation and marketing. He is a deal maker and a visionary with an impressive and well above average track record in Sales. Fabio is also Alliance Lp Drones Multicopters Test Pilot, additionally he covers a consultative role by advising our clients for all integrative aspects of Unmanned Aerial Systems implementation. Faiz is a young and talented Aviation Engineer. Aviation Mechatronic System Integration Engineer at Alliance Lp Drones Ltd.
Dr. Takada is the CFO of Alliance Group Ltd.
She is a very diligent and dedicated CFO; Narumi is responsible for loan procurement with Alliance UAV Finance, logistic operations, and she also coordinates Alliance UAV Robotics consultancy services. Tanakit is Alliance Lp Drones Unmanned Aerial Vehicles Test Pilot. Tanakit is a superb demonstration pilot with an above average ability to recover from extreme unusual attitudes. We have 2 production plants to manufacture our range of UAVs. Alliance also has a shared testing facility (indoor/outdoor) to test all standard platforms and custom made prototypes. Our team includes a small number of manufacturing staff and additional technical support engineers to train the clients on line prior to go and complete the training onsite. Alliance strategic partners are experts in robotic applications, and many of them come with a successful and proven work history from the civil and defense sectors. 1994: Dr. Leopoldo Stefanutti Scientific Consultant received the Eminent Scientist Award from NIWA (New Zealand). 1998: a Doctorate Honoris Causa from the University “Claude Bernard” of Lyon for it's contribution to the understanding of the Stratospheric Ozone Chemistry by means of lidar research. 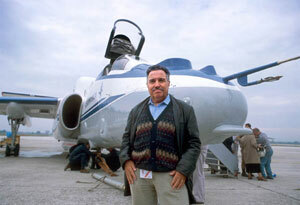 From 1986 to 1995: Scientific consultant of ESA for lidar applications in Space. He was also a member of the European Panel on Stratospheric Ozone. Dr. Stefanutti has been a member of the Scientific Core Group for SESAME and THESEO European campaigns. Presently Dr. Leopoldo Stefanutti is a scientific adviser on the Board of Advisors of Alliance Lp Drones Ltd., Hermes ATMOSAT UAV Project. Oxford graduate Mr. Paul Galbraith is Hermes ATMOSAT UAV Project Commercial and Financial Advisor. Paul is a positive, proactive and highly dynamic commercial, strategic and business professional who possesses superb interpersonal and communication skills along with an extraordinary range and breadth of experience across a wide range of industries and locations. Mr. Dex Halpin brings to the board many years of significant experience working with the best brands in the unmanned aerial vehicle's industry as well as with the Royal Air Force. UAV Program Manager - Global. Commercial Lead for Acoustic Vector Sensor Systems - USA & UK. Business Drivers/Market Analysis. Risk assessment/Analysis Collaborate/Manage Cross-functional Teams. Research & Development/Test Coordination. Strategic and Long Range. Planning. compliance Development. August 2014 – August 2015. Manager for the highly successful Bristow15 C-UAS Trial. UCAV/UCAS. Autonomous Systems. Automated Air to Air Refueling. International Collaboration - NAVAIR/AFRL. Safety/Human Factors. Airspace ISR/Combat Modeling. Dr. Donna A. Dulo MS, MA, MSSE, MAS, MBA, JD, is a senior mathematician, computer scientist, and software/systems engineer for the US Department of Defense where she has worked for 24 years in both military and civilian capacities. She is a consultant and speaker for the NASA Ames Research Center and is an adjunct professor of computer science and software engineering for several universities. She is also an astronomy educator at the Monterey Institute for Research in Astronomy, where she has taught astronomy for over 15 years. Dr. Dulo did her undergraduate work at the US Coast Guard Academy in Management Economics. Her work included an MS in Computer Science from the US Naval Postgraduate School, an MS in Systems Engineering from Johns Hopkins University focusing on space systems, an MAS in Aeronautics and Aerospace Safety Systems from Embry-Riddle Aeronautical University, an MBA in Engineering Management from City University, an MA in National Security from the US Naval War College, and a Doctorate of Jurisprudence from the Monterey College of Law.